Second, while many teams tank seasons, and a few can tank several seasons in succession, just the Kings have tanked two generations, with only the Chris Webber seasons as respite. The one time the Kings forgot who they are supposed to be, the Los Angeles Lakers put them straight (or, if you believe Tim Donaghy, the laws of competitive imbalance put them straight). So in firing Dave Joerger Thursday after their best record in 13 years, the Kings did what they do—they approach hope slowly and carefully, and then violently stamp it out. And again, the right place to look for the impetus is toward the Lakers. The Kings are almost surely the most imitative bad team in recent NBA history. They fell in love with defense when they hired Michael Malone from the Golden State Warriors, and waited until he developed a useful and potentially productive bond with DeMarcus Cousins to fire Malone, after 116 games, a hot start to the second year, and Cousins catching viral meningitis. Then they fell in love with offense, hired Joerger, saw him adjust his reputation to accommodate a pacier and more entertaining style, and then fired him. They’ve been in love with the Warriors since owner Vivek Ranadive broke with Joe Lacob when both were investors at Golden State. They even signed Seth Curry for a bit, and DNA is as imitative as it gets. 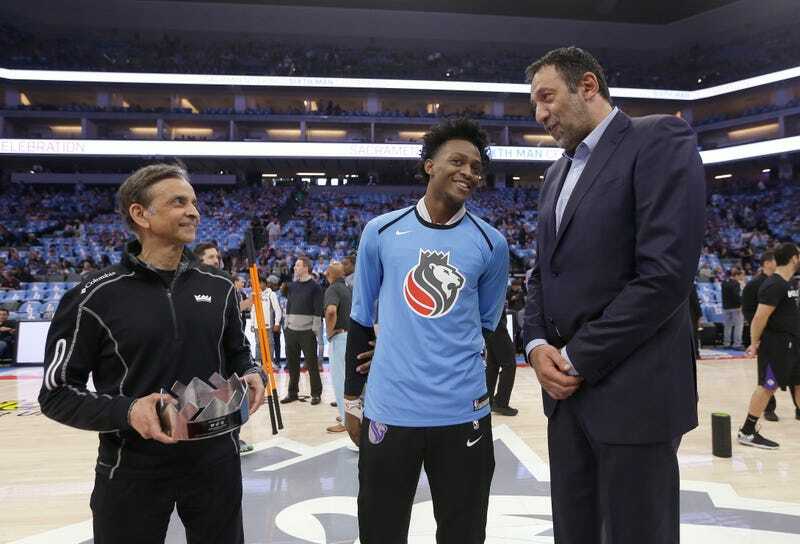 The Kings not only won more games than they have in the latest no-postseason-for-you-era, they fielded a coherent roster inspired by point guard De’Aaron Fox, Buddy Hield, Willie Cauley-Stein, and Nemanja Bjelica. They were a middle-of-the-pack team offensively, slightly below the mean defensively, and near the top in pure pace. Everything they did, they did at a high rate of speed, which made them a fun watch for the first time since the Webber years but may have led to Joerger’s demise because his reluctance to commit more minutes to Marvin Bagley III became a point of contention between him and Divac. In short, politics over product—the Kings. Now I suppose we will be told soon enough that Joerger alienated the players, or he couldn’t co-exist with Vlade Divac, or devoured puppies. That’s how the NBA works with good teams and bad ones—a weird thing happens, leaks flow from all corners to fight the tedious two-day narrative battle , and then a new victim is placed forward, and the entire process repeats itself. The Kings have had 18 coaches in 34 years, an average of one full season and then a late-season firing in year two; Joerger’s tenure was longer than any Sacramento coach save Garry St. Jean and Rick Adelman. And then someone was done: Joerger. Maybe it was because they fell in love with the idea of Luke Walton (a former Warriors assistant, now either about to be fired in Los Angeles or given tenure). Maybe they were inspired by Magic Johnson’s middle finger to the flaming dumpster he collaborated on with Jeanie Buss, Rob Pelinka (and presumably by proxy Kobe Bryant), LeBron James (and entourage) and for all we know, Jack Nicholson. Maybe finishing ahead of the Lakers, as the Kings have in five of the last six seasons, was starting to become tedious. All sounding kind of Laker-y to you? Well, let’s try one more thing here. Remember how the nation argued about Magic’s qualifications for the job of team president? Well, what exactly has Divac done in his five years running the Kings to make you think he is any more effective? The gaudy 160-250 record? The four fired coaches? The Cousins trade that was so vital to team interests that it had to be done literally during the All-Star Game? Maybe the issue rests not only with Divac but with his boss as well, which is also Lakertastic given that Buss has made an entire front office out of names pulled from the alumni magazine. Maybe it’s Ranadive, the software magnate whose patience is measured by atomic physicists. Maybe having failed to imitate the Warriors, Ranadive has decided to try the other end of the pool. Either way, the Golden State Warriors smile today because no matter the future holds for them, they know that the very worst that can happen is that they are in a two-team division for the foreseeable future, and the other team is Steve Ballmer. Ray Ratto had such hope for the Kings this year. Ray Ratto is a fool.